I always encourage students from my Modern Calligraphy workshops to try out different nibs. Each nib have different personalities and lead to different styles and results. I definitely found my favorite nibs through trial and error. Hiro 41 - Hiro 41 and I didn't like each other at first. It was in the bottom of my nib box for quite some time until I began practicing Copperplate calligraphy. This nib is perfect for it. I have yet to find a nib that achieves the square top and bottoms in Copperplate like Hiro 41 does. Nikko G - Like Hiro 41, Nikko G and I first didn't like each other. It's a very stiff nib and in the beginning, I wanted to achieve that super thick downstrokes. It's always a hit in my workshops though and a great beginner nib. If I ever want to achieve a more romantic, and sort of dreamy kind of style or practice Spencerian calligraphy, I go straight to Nikko G.
Brause EF 66 - Speaking of super thick downstrokes, Brause EF 66 was my very first nib soulmate. It's not beginner friendly and the most flexible out of all my favorite nibs. It's a pain to clean cause the nib is so small. But if I want that nice contrast of thick and thin strokes, Brause EF 66 is it. The Brause Steno Pen Nib aka The Blue Pumpkin - The Blue Pumpkin (its nickname) is a great beginner nib and even now, it's what I use everyday. It's stiff but has a little bit more flexibility to it. One of my favorite nibs for modern calligraphy. I'm not sure when I began mixing non-traditional "inks" to use for calligraphy. It's probably when I stumbled on Bleedproof White and it definitely needs to be mixed before it can even be used. First, pick a non-traditional "ink" that you'd like to mix. I've used watercolors, gouache and even $1 craft acrylic paint to mix for calligraphy use. The sky is the limit and I encourage you to experiment. Then you'll need water, an ink container, and something to stir it all with. Simple as that. I've heard of other calligraphers using gum arabic, but I ended up using what I had on hand - tap water and a toothpick. For the water, I often take it straight out of the faucet, letting it slowly drip or I use an empty ink bottle with it's dropper. Consistency is absolute key. The goal is to create a milk-like ink consistency. The ink must have a consistency like that of milk. The true test is if it flows smoothly out of your nib. If it blobs up in the nib and doesn't come out, it's too thick and need more water. If it's too runny, there's too much water. Add and mix in a little bit of your "ink" back in. It's trial and error, but when you get the hang of it, you can have all sorts of inks available at your fingertips. FW Black Ink was my first ink ever and it's still the ink I use for when I am practicing calligraphy. Sumi Ink, on the other hand, is my go to for anything profession, whether for weddings or if I'm turning quotes into prints. The bottle of Sumi lasts a long, long time. I'm only on my second bottle ever! What's the difference in both? Not much, really. Both are waterproof, no mixing needed and great for beginners. Both inks dry with a slight sheen to it. Once I found this Copperplate Gold, I didn't even bother looking for any other gold ink out there. Sure, I tried some other ones, but it's wasn't the same. Copperplate Gold is opaque and can be used straight out of the bottle. It's a little thicker and can take some getting used to. If I have some trouble getting it to flow smoothly out of my nib, I mix some water with it. The only downside to this gold, or any gold for that matter, is you have to mix it now and then while you're writing with it. Otherwise the gold settles on the bottom of the bottle and it becomes bronze. Bleedproof White is the only white ink I use. It is not beginner friendly and needs mixing. It's basically a solid and technically, not originally used as ink to begin with. But you only need to mix it with water to make it into a milk-like consistency, and if mixed right, the outcome is a matte, opaque white that can't be beat. In the past few weeks, I've been featuring some of my previous students who I've been blessed to share the art of modern calligraphy. They've shared a little bit about themselves, and what their advice is for those just picking up the pointed pen for the first time. Jordan made me laugh so hard in class when she Instragrammed a photo with a caption of "Y'all! I just calligraphied my initials (& made calligraphy a verb)" Seriously one of the best reactions of excitement I've heard when learning calligraphy. I'm so thrilled to watch her grow and even try new things, like writing on textured paper. Tells us a little about you. My name is Jordan. I work full-time as a Research Specialist at a local school district - meaning: I generally spend lots of time staring at a computer screen. To balance out my fierce need to create, I spend my time away from the office crafting - mostly sewing (my favorite!) and making jewelry for my handmade business - resliced. I'm also a big fan of running (as a way to justify the pizza & cupcakes I love so much), rescuing black dogs (but I'm at my limit with 3!) and blogging about all the things I love (and the occasional DIY) at resliced by Jordan. What made you interested in learning calligraphy? I have been watching the fancy envelope pictures float around Pinterest and had tried [unsuccessfully] to copy them several times. I absolutely love sending snail mail. I wanted to spruce up the exterior of the cards I send because I selfishly wanted the whole experience of receiving a card from me to be fabulous from the moment they saw it all the way through my concluding salutation (and as a way to distract them from the fact that there was no money inside). I realize that receiving something other than bills in your mailbox is nice, but finding something fancy in your mailbox is even better! What is your advice for those picking up the pointed pen for the first time? Don't be afraid to use your pencil! 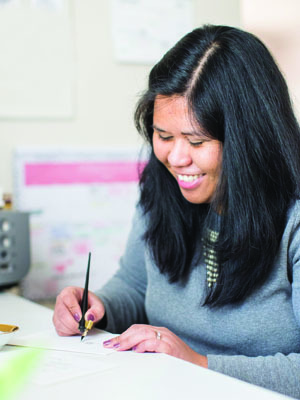 After I took Paulene's Modern Calligraphy class, I went home and immediately felt like I'd digressed. I started lightly drawing lines on my envelopes before I started with the ink and that really helped me focus on alignment. Sometimes I even outline the text I plan to write so that I can make sure it fits appropriately and looks how I'd envisioned. Another tip: avoid comparing yourself to others! When I find a new craft I want to pursue, I dive head first into researching everything about it (I've already admitted I'm a researcher by trade so no surprise, huh?!). With calligraphy, I quickly found a billion absolutely stunning blogs. They were beautiful, but they caused me to quickly spiral into a cloud of self-doubt. At this point, I've kind of given up following a specific style (because I'm a perfectionist and following a strict style always stresses me out). I'm no professional [that's for sure! ], but I'm starting to embrace my style! What's something with calligraphy you've tried that's become your favorite? Something like color combo, Nib, Ink, etc? The best thing I've tried so far was testing out The Postman Knock's "5 Unique Ways to Address an Envelope". The Lawrence style is my favorite - I loved wrapping the names in calligraphy around the address on the envelope. I used the bottom and top of a cup to draw the circles (because I didn't feel like digging the ribbon wheels out from my holiday stash!) and it worked perfect. I also like The Margaret style - it was kind of fun writing the address backwards! In the next coming weeks, I will be featuring some of my previous students who I've been blessed to share the art of modern calligraphy. They'll share a little bit about themselves, and what their advice is for those just picking up the pointed pen for the first time. The gold ink I let my students try in class is not very beginner friendly. I still remember Anne being one that just kept trying to work with gold ink. I even remember her saying that the gold is worth the hassle. I am so proud of how far she's come and love her fun attitude towards calligraphy. Anne provided so much great, beginner information below. Tells us a little about you. My name is Anne and I work at a bank by day and am in school at night. I grew up in Charlotte and moved to Greenville for college and never left! I love sending mail, baking WAY TOO MANY desserts, and I am an EPIC FAILURE at crafting (Pinterest fail is a normal outcome for me). I want to be one of those crafty people - but its not in the cards! What made you interested in learning calligraphy? I love sending mail and calligraphy on envelopes is AMAZING! I have wanted to learn for a while and I finally decided to take the plunge - I figured I should give it a shot and I fell in love with it! It's a great way to unwind at the end of a long day and now my envelopes look so fancy! I know I have a ton of work to get them looking perfect but I am enjoying the practice! Best part - my lack of craftiness is not a problem!! I feel like I make mistakes all the time - but its never a failure! I am so glad that I stumbled on Paulene's instagram page and found out about the classes - Calligraphy has been so much fun! What is your advice for those picking up the pointed pen for the first time? Be patient!! Progress feels really slow - but it's very helpful to keep older practice to look back at. On days that I am getting frustrated it's so nice to look back at the first attempts at the letters and appreciate how far I have come. It's so hard to remember to slow down - my letters look so much better when I really take my time. Go slow - it's really worth it! Experiment with different nibs - I really hate some and love others and everyone has an opinion on them. Good thing they are not too expensive - it's quickly becoming an addiction! Paper & Ink Arts has become a go to shopping website….my cart seems to fill itself up! What's something with calligraphy you've tried that's become your favorite? Something like color combo, Nib, Ink, etc? GOLD INK!!!! Even the biggest mistakes and ink blots look nicer in gold! It's my favorite and I find that I reach for it every time! I am trying to work more with black ink - but its hard to cheat on the gold! I have also found that good paper is helpful - it does not have to be super expensive but the cheapest copy paper was not so great for me. I went for the slightly nicer printer paper (it's still only around $17 for 500 sheets - not too bad!) and it has really made a difference. I am also loving the G nibs (nikko and zebra specifically). I tend to press really hard on the page and they are a bit more forgiving than others. It has also been fun to "customize" my alphabet - I'm still experimenting with different styles for each letter.